Crimson Cup is kicking off 2018 with a series of classes designed to teach central Ohioans to appreciate the finer points of coffee. All classes take place at our SCA-certified Crimson Cup Innovation Lab, 700 Alum Creek, just south of Bexley. “Coffee education is a big part of our mission here at Crimson Cup,” said Founder and President Greg Ubert. “We’re proud to offer local coffee aficionados the chance to learn in the same space we developed to train baristas and other coffee professionals from throughout the country. The beginning class schedule is outlined below. Classes will repeat throughout 2018 based on demand. Brewing 701: Methods. Saturday, February 10, 10 a.m. to 12 p.m. This course explores the science behind coffee via demonstrations of Chemex, Hario v60 and French Press brewing methods. 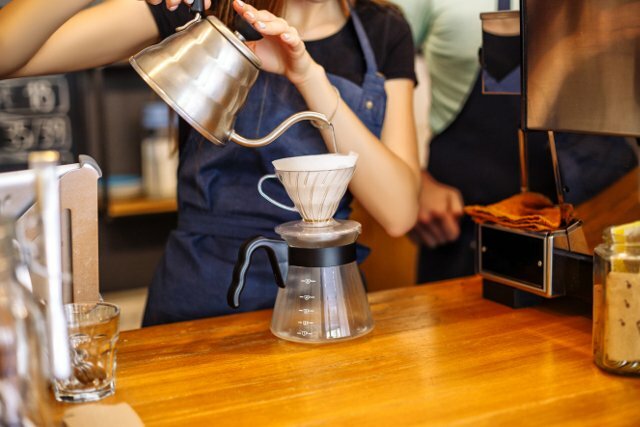 Students will learn how to prepare a perfect hand-pour coffee – including proper brewing temperatures, coffee grind, coffee-to-water ratios and pouring techniques. Each student will leave with a Crimson Cup Mug and free drink card to redeem at Crimson Cup Coffee Houses. Cost for the two-hour course is $50. Registration is limited to eight. Registration is limited to eight. Register online. Coffee 701. Seed to Sip. Saturday, March 10, 10 a.m. – 12 p.m. This is an introductory course about the history, cultivation and trade of the world’s number-one cash crop, beginning with the legend of Kaldi and his dancing goats. Coffee buyer Dave Eldridge will share stories gleaned from travel to coffee-growing countries in Central and South America, Africa and Asia, with a focus on the Indonesian Island of Sumatra. Participants will taste award-winning Crimson Cup coffees. Cost is $25, and registration is limited to 12. Participants will receive a Crimson Cup Mug and free drink card to redeem at Crimson Cup Coffee Houses. Register online. Cupper’s Choice Roasting 701. Date to be Determined. Designed for home roasters and craft beverage enthusiasts, this class allows students to examine green coffee and dive into some of the basics of the coffee roasting process. Participants will roast their own coffee on both a sample roaster and a production roaster. Basic organic chemistry will be discussed to describe the roasting curve. Each participant will leave with a bag of one of Crimson Cup’s finest craft coffees. The class costs $75, and registration is limited to five students. Register online.